The Department of Immigration Services rolled out issuance of the e-Passport on 1st September, 2017. 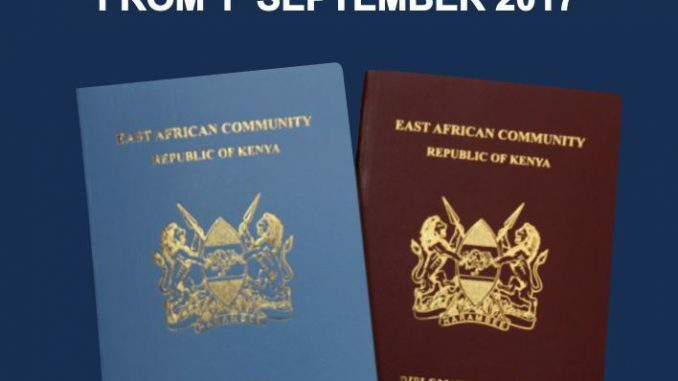 Holders of current passports are advised to apply for the e-Passport online through the e-citizen platform www.ecitizen.go.ke and present themselves to the Accredited Immigration e-Passport Processing Centers for profiling and biometrics capture. Accredited centres in Europe are: Embassy of Kenya in Berlin, Embassy of Kenya in Paris and The Kenyan High Commission in London. The Embassy of Kenya in Rome has not yet been accredited to process e-Passports. Applicants submitting applications through this Embassy will continue applying through the usual Form 19 (downloadable from this website) and will be issued with the normal passport. All passport applications will be forwarded to Nairobi for further processing and issuance.